So… a couple of days ago, The Legal Genealogist told Oregonians about a terrific resource for legal research into the early laws of Oregon and a number of west coast and mountain states. The State of Oregon Law Library offers fabulous online resources, including free access to a database called Fastcase that’s got both case and statutory law options. Now that was just dandy for the folks from, say, the Bend Genealogical Society where I spoke this past Saturday. But what about the folks from, say, the Tacoma-Pierce County Genealogical Society where I’m going to be speaking on Friday and Saturday? There are resources for Washingtonians as well. The database collections available there are absolutely terrific. The library subscribes to HeinOnline, a comprehensive online legal research resource, and the list of specific databases available includes the Session Laws Library — the session laws of all 50 U.S. states back to inception. So… what’s the hitch? You have to be there, physically, at the library in Olympia to use this. Especially if you’re nowhere near Olympia, Washington, or it’s three o’clock in the morning. But don’t despair. 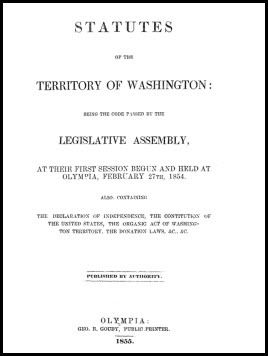 For that early Washington law, there’s still an online option. There’s no one-stop-shopping search function — you have to open and/or download each volume, file by file — but because these are PDF files, they’re all word-searchable. So when you need to know what the law was in Washington — and we all know by know how important it is to know the law at the time and in the place where the record we’re looking at was created, right? — there is a place to find it. Thanks for this terrific resource, Judy. My 2nd great-grandfather, Francis William “F.W.” PETTYGROVE, came to this area, arriving in Portland ORE May 19, 1843, along with his married sister and family, and his very new bride and first son, born in the Sandwich Islands. By April 1852, he had moved up to Port Townsend, one of the first 4 with land grants in the region. I’m hoping to find out even more about him and his family, hopefully this year. In the meantime, I’m counting the days to the Tacoma-Pierce County Genealogical Society Seminar! Looking forward to meeting you in person. Cheers from Vancouver BC. I searched for “genealogy” and got links to 2 years 1915 and 1951. Interesting that Google (I think) is “smart” enough NOT to just give you a link to a 200-page PDF. So, at least in my case, Google returned with pseudo-pdfs for a given “chapter”. In my example, one result was for “1915c180.pdf” consisting of the 2-pages that made up Chapter 180, even though the WA State doc is “1915pam1.pdf” with all chapters!! That’s pretty hit-or-miss on this site, I’m afraid. Your results were okay, I guess, but other search terms aren’t so good. Curious! What did you try that did not work? How did you know the search missed? If Google indexes a PDF, all search terms should work. If you have a result my “site” search did NOT find, is the directory path to the doc different from the one I used? I got 15,000+ hits on the word “governor”, but did not verify that every session-year was in the result. I cannot see why Google would index only a subset of the documents, unless some docs were added since the last index update (seems unlikely?). If some sessions were done using OCR, that could cause misses. Or some of the PDFs might be page images only without searchable text. Give me a couple examples of “site” search failures and I will look for an explanation.